The Suffolk Punch horse has a long and well-established history as a draught animal of English origin. Arthur Young, one of the earliest writers on British livestock, and who himself came from Suffolk, was the first to refer, in 1771, to the area’s 'noble breed of horfes', as a distinct breed. He noted that even in his childhood (he was born in 1741) the Suffolk was referred to as ‘The Old Breed.’ It is almost certainly the oldest existing pure breed of draught horse to have originated in England. William Youatt in 1837, and David Low in 1845, both equally renowned as recorders of early livestock in Britain, also wrote enthusiastically of the Suffolk, noting its distinctive 'stout or punchy form', with large head and deep neck, and particularly its steadiness in draught – 'no horses exerted themselves better at a dead pull'. 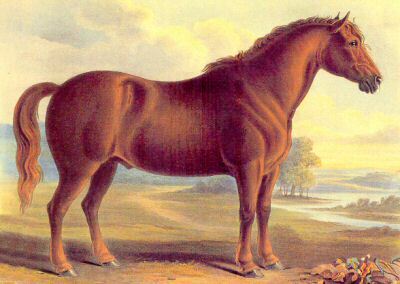 The William Shiels painting of a Suffolk Punch shown here was commissioned by David Low in the 1830s. New Zealand Suffolk Punch filly, 2003. But the two features which at first glance most distinguished the Suffolk Punch from other British draught horses were its colour – generally described as chesnut (although it could vary from dun to sorrel), and the lack of the ‘feathering’ which is so characteristic of the Clydesdale and Shire, on its heels. Robert Wallace, writing in 1888, thought the Suffolk’s body looked 'much too heavy' for its 'clean and fine' legs. Today the Suffolk Punch survives in only small numbers in various countries throughout the world. The Rare Breeds Survival Trust lists the breed as ‘critical’ in Britain. 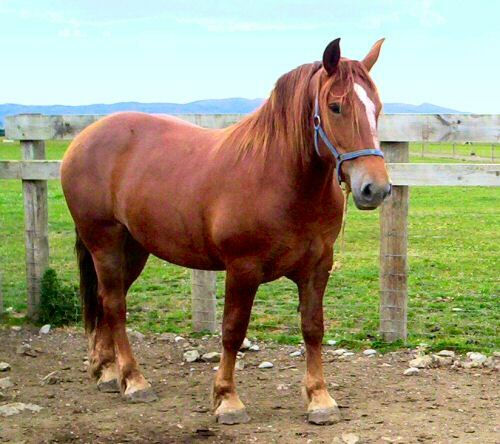 Although some Suffolk Punches were reimported into New Zealand towards the end of the twentieth century, by 2015 only a single stallion and a mare could be located. The Rare Breeds Conservation Society is currently trying to rescue this breed – see Suffolk Punch Rescue Project.